The Neighbourhood Development Programme (NDP) Unit was established in 2006 and is responsible for managing the Neighbourhood Development Partnership Grant (NDPG). The NDPG is driven by the notion that public investment and funding can be used creatively to attract private and community investment to unlock the social and economic potential in targeted underserved neighbourhoods, generally townships. This in turn will not only improve the quality of life of residents but also contribute to South Africa’s economic performance. The purpose of the grant is to therefore fund, support and facilitate the planning and development of neighbourhood development programmes and projects that provide catalytic infrastructure to leverage third party public and private sector investment for future and more sustainable development. The management of the NDPG, and includes a planning grant, for Technical Assistance (TA) and a Capital Grant (CG). The NDP Unit recently joined the Inter-Governmental Relations (IGR) division at National Treasury to work in conjunction with the City Support Programme. The strategic role of urban centres in enabling the necessary conditions for achieving key government outcomes is well documented locally and internationally. During 2011/12 the NDP evaluated the performance of the NDP grant and as a result embarked on a process of strategic planning to deepen value for money and long term impact. The result was the formulation of a new strategy, known as the Urban Networks Strategy (UNS) which is a pro-poor/pro-growth investment approach. The strategy which is aimed at facilitating the eradication of spatial inequality to enable the creation of liveable, sustainable, resilient, efficient and integrated human settlements. The focus of this strategy is to shift infrastructure investments towards the creation of efficient and effective urban centres through an approach of spatial targeting of public investment, primarily infrastructure. 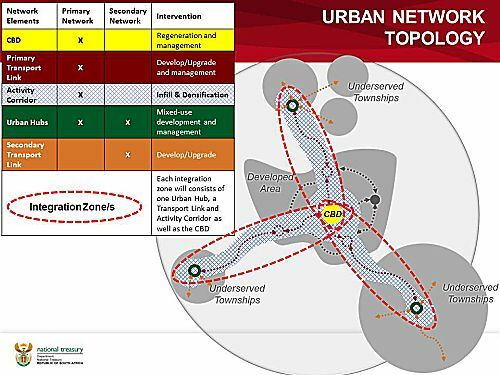 The Urban Network is a city-wide interconnected hierarchy of strategic nodes and public transport links between and within nodes. It consists of primary and secondary networks that interconnect at strategic nodes known as urban hubs, which are located within marginalised areas, typically townships. The new strategy is reflected in the amendment of the 2014/2015 DORA NDPG Framework which states that future NDPG allocations will be focused on municipalities and projects that align with the NDPG’s prioritisation criteria. These for example include population densities, levels and diversity of economic activity, concentration of poverty and the presence of connectivity networks i.e. public transport. The application of these criteria across the NDPG portfolio of municipalities has resulted in the identification of 18 urban municipalities and include South Africa’s larger urban centres as well as key regional service centres. The focus of this Urban Networks Strategy, as the name implies, is to shift infrastructure investments towards the creation of efficient and effective urban centres that will increase economic growth, create employment and increase access to urban amenities, especially for the poor located in marginalised settlement areas, such as townships. The NDP will work in partnership with other strategic spatial, transit orientated grants including the Public Transport Infrastructure and Systems (PTIS) Grant and Urban Settlement Development Grant (USDG) to support the implementation of projects across the urban network. The balance of the municipalities in the NDPG portfolio has been classified as rural NDP municipalities.